Feb 27, 2014 | By CENS | SUNLIKE DISPLAY TECH. CORP.
Sunlike Display Tech Corp. was founded in March 1996 to manufacture twisted nematic (TN), super TN (STN), fast-response STN (FSTN), chip-on-board (COB), tape automatic bonding (TAB), chip-on-glass (COG) LCD modules for contract buyers and others. 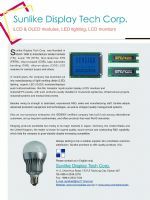 In recent years, the company has branched out into manufacturing of light emitting diode (LED) lighting, organic LED (OLED) modules/displays/push buttons/switches, thin-film transistor liquid-crystal display (LCD) monitors and industrial PC panels, with such products usually installed in household appliances, infrastructural projects, industrial systems and medical instruments. Besides owing its strength to dedicated, experienced R&D, sales and manufacturing staff, Sunlike adopts advanced production equipment and technologies, as well as stringent quality management systems. Also an eco-conscious enterprise, the ISO9001-certified company has built trust among international customers, set up long-term partnerships, and offers products that meet RoHS standards. Shipping products worldwide but mostly to its major markets in Japan, Germany, the United States and the United Kingdom, the maker is known for superb quality, sound service and outstanding R&D capability, which help the company to grow steadily despite increasing competition. Please contact us in English only.